"Lights! Camera! Action!" The gunslinger, dressed in black and brandishing a shiny Colt 45, swaggers out into the middle of the plaza. The town's sheriff, sporting a large silver star and his own six-gun, slowly enters from the opposite side. They pause. Then Bang! Bang! And the desperado slumps to the ground. The smell of gunsmoke fills the air. "Cut! Print!," yells the director. Just another day on the set of a T.V. western. No, not exactly. For this gunfight was staged for an audience of onlookers as part of the daily presentations at Old Tucson Studios and Theme Park, outside of Tucson, Arizona. While over 300 films and T.V. shows have been shot on its dusty streets, this fake western town also plays host to nearly half a million visitors each year. Young and old come to witness gunfights, court battles, dance hall revues, and stagecoach robberies, all part of the live entertainment presented by the park. For those who think they'll see actual filming, there's a slim chance, but probably not, since large crowds would hamper production. However, visitors can see where filming of such famous movies as "How the West Was Won, "Hombre," and "Three Amigos" took place. Western TV. 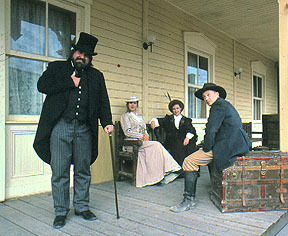 buffs can imagine Matt Dillon, Miss Kitty and Doc Holiday as they sit on the porch of the saloon. Or maybe the pounding of hoofs of the famous 20-mule team of "Death Valley Days," as it pulled into town. And don't forget Laura Wilder skipping through the fictional town of Walnut Grove in "Little House on the Prairie." Old Tucson Studios came to life in 1939 when Columbia Pictures chose the site to build a replica of 1860s Tucson for the movie ""Arizona." The film set a new standard for realism for Hollywood westerns, initiating the move from studio backdrop to location filming. More than 50 buildings were constructed in 40 days, but after the filming of "Arizona," the set lay dormant until 1959, when entrepreneur Robert Shelton had the foresight to see its potential both as a film studio and family attraction. It opened in 1960 and continued to grow, attracting such Hollywood legends as John Wayne, who filmed four movies-- "Rio Bravo," "MCLINTOCK!," "El Dorado," and "Rio Lobo"--each time adding more buildings. But a spectacular fire, sweeping through the oldest part of town in April, 1995, and destroying over 40 percent of the park, almost put an end to western film history. Landmarks, such as the McLintock Hotel, Rio Lobo Cantina, and the Mission in Mexican Plaza, as well as the soundstage, were leveled. With keen attention to detail, the owners rebuilt the park, adding new restaurants, gift shops and show venues while preserving the it's late 19th-century charm. This January the park re-opened with new buildings and a more efficient layout. Unfortunately, much of the Hollywood glamour was lost in the fire. But the show must go on. Among the new buildings are the Grand Palace Saloon and Hotel, the Town Hall and a reconstructed Mexican Mission and subterranean Storyteller Theater. The goal: To have guests live a day-in-the-life of a late 1800s western town. Old movie sets, like that from "High Chaparral," film memorabilia and authentic items from the Old West add authenticity. Through a film camera lens, Old Tucson Studios has played a prominent role in shaping the world's perception of the Old West. Now, after six decades, hundreds of films and a devastating fire, the world famous film studio and western theme park has risen from the ashes to once again claim its title as "Hollywood in the Desert."